When I saw the foundation I started to think of a large living room with a split-level entry. It actually grew to a split-level staircase too and I think I built the house in a style close to the Spanish colonial. The entrance leads you into a big and colorful hall - the staircase is flanked by pairs of Tuscan columns that support the upper floor of the hall. There is a split-level staircase that offers elegance and complexity to the interior. The living rooms consists of a dining and a sitting area, it also has a bookcase and a vintage stereo, as well as a chess table. Just behind the staircase are the kitchen and the guest bathroom. 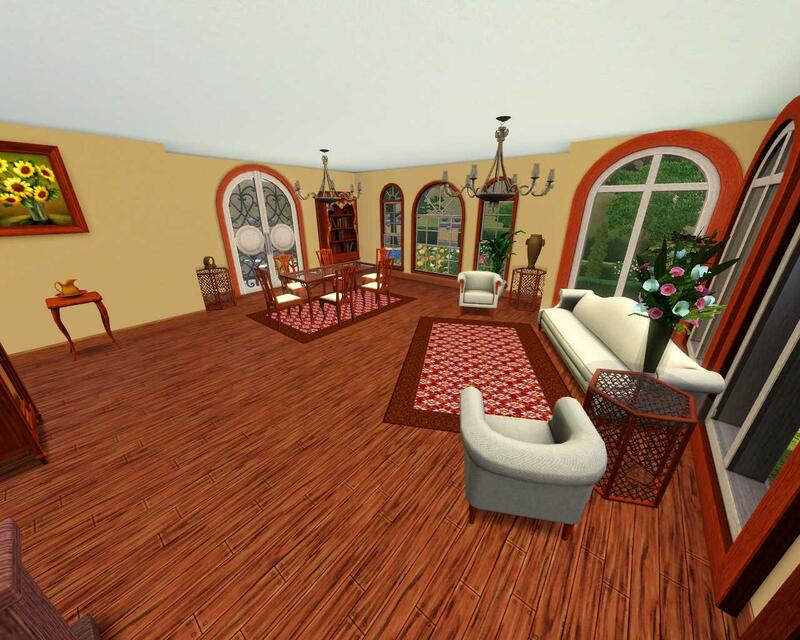 I chose warm colors for all the rooms in the house so that it could look very cozy. Taking the staircase downstairs you enter the playroom, where you can find a pool table, a small bar and also a sitting area. The staircase leads you to the second floor, from where you can see the entrance and also the majestically hanging "Enigmatic Tapestry" The giant chandelier finished the hall with a gentle touch. From there you can access the master bedroom and it is also in warm colors. The bedrooms also has it's own balcony from which you can see the front garden and the street. A small room after that offers you the chance to look at the bathroom or you could go on the mansard floor via the spiral staircase. The mansard floor has a small corridor which offer access to three rooms, one of which is the media room. It has a flat screen TV, sofa and a chair but despite the little furnishings it is also cozy, yet classy. There is also one bedroom located on this floor - it has a splendid view from the tower and it is colored in relaxing pink. The garden consists of three portions - front, side and back. In the front portion there is a small garden with flowers and a fountain, the garage also stands there. The side portion is an alley, which leads to the pool and in the back there are the pool itself, a couple of lounge chairs and also another bar, so that sims could enjoy those hot days and warm summer nights outside.